There’s a new addition to the Outback Steakhouse menu that steak-lovers will find truly drool-worthy. Not that we ever need an excuse to head to Outback, but their new Hand-Carved Roasted Sirloin had us planning an emergency date night. 😉 Outback Steakhouse sponsored this post, but all opinions are my own. Outback Steakhouse is one of our favorite places to go out to dinner. We don’t dine out all that often, and neither of us likes to spend a lot of money on food. The Outback Steakhouse menu is packed with affordable choices that are just as scrumptious as a fancy steakhouse. The atmosphere is relaxed, the people are friendly, and every outing we have had at Outback has been extremely pleasant. Classic Roasted Sirloin: Tenders slices of roasted sirloin topped with a rich Cabernet sauce, served with garlic mashed potatoes and broccoli. Marsala Roasted Sirloin: Tender slices of roasted sirloin topped with sautéed mushrooms and a savory Marsala sauce. Served with creamy Parmesan rice and broccoli. 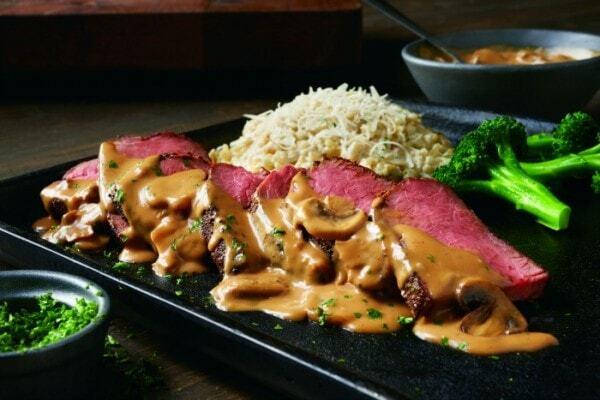 Bistro Roasted Sirloin: Tenders slices of roasted sirloin topped with a creamy Dijon bistro sauce. Served with crispy diced potatoes and broccoli. Seriously, how does one choose? Thank goodness the steak dinner is so affordable since I will require frequent trips to try them all. Oh, and if you want a forkless option, you can enjoy Roasted Sirloin in the all new Steakhouse Quesadillas. Stuffed with slow-roasted sirloin, Monterey jack cheese, chipotle spread, cilantro, and green onions, the Steakhouse Quesadillas are on my must-try list. See the full Outback Steakhouse menu and find a location near you on their website. Make sure to follow Outback on Twitter and like their Facebook page so you don’t miss a thing! 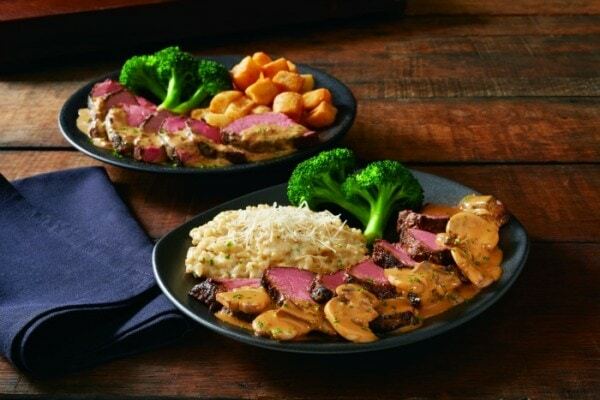 Which Outback Steakhouse menu item are you most excited to try? The steaks look fabulous but then so does the hand breaded shrimp. OH to make a choice. I might have to go for both. No I would share with someone. I visited website and Outback does have a lot of menu items that my husband would enjoy. We have never been there as of yet. 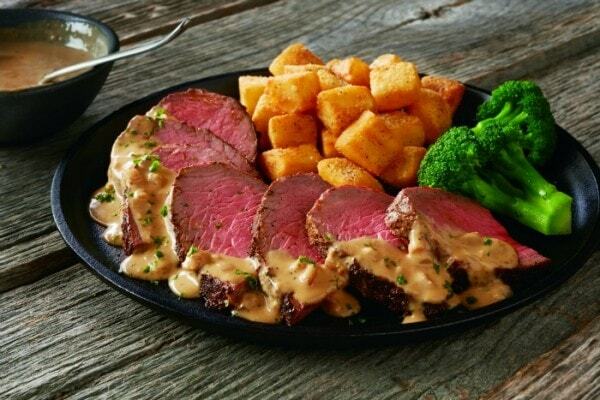 I would love to try the Bistro Riasted Sirloin at Outback. I love Outback…drool worthy food. Yum! I love the Bloomin’ Onion! I love the shrimp at Outback and their bloomin onion of course! We love the steaks at Outback and of course the Bloomin Onion! I love Outback and going to the site just made me hungry even though I just had dinner. LOL! My favorite of course is Bloomin Onions…YUMMERS! And their steaks! Oh and can’t forget Alice Spring chicken! We havent been to Outback in a while. I’d love to try the Classic Roasted Sirloin because I love the mashed potatoes. We love the Alice Springs Chicken & Coconut Shrimp. Roasted Sirloin prices start at only $10.99. I have always loved Outbacks Bloomin Onion . I would love to try their Victoria’s filet. It sounds really yummy! I’d love to try the Bloomin Burger and of course the Bloomin Onion. I love their simply grilled tilapia, their wings, and their clam chowder! YUM! That looks so good! Outback is one of my favorite restaurants of all time. Filets and the Alice Springs Chicken are the best! Thanks for the chance! The hand carved roasted sirloin looks awesome! Their Marsala Roasted Sirloin looks delicious! Thank you! I adore my local Outback Steakhouse. Great food and great service. You just can’t go wrong. The new roasted sirloin sounds seriously amazing! It looks so delicious and perfect for Valentine’s Day. Outback is my husband and I’s favorite place to eat together. It was the first restaurant we ever went to together! It has a great atmosphere and excellent food. We love it! My wife and I just went to Outback Steakhouse, and now I have guilt for not getting the roasted sirloin. That looks amazing. I love to get the Victoria’s Filet Mignon! Haven’t been to Outback for awhile. but that Roast Beef looks yummy! I would love a steak and Bloomin Onion at Outback! I love the rib eye at Outback!!! Going to take my handsome hubby there fur Valentine’s day!!! I just realized that the outback that was closest to me is no longer there. Guess I will have to travel a couple hours to get to one. But it’s worth it. I love Outback!! Delicious food!! I would love to try Bistro Roasted Sirloin. The meats looks inviting and juicie. I am a steak lover but the best meal I ever got at Outback was a chicken breast! I wish we had an Outback closer, we only eat at them when we travel. I have a gift card a year old waiting to be used. Love the fact that I can order online. The Marsala roasted sirloin sounds amazing! We almost went this weekend to try the sirloin. It’s still on my list to try! I may have to stop in to my local Outback for a bowl of the Baked Potato Soup! I’d take my husband out for dinner-looks good! I’d love to try the steakhouse quesadilla! Yum!!! We haven’t been here in a few years, sounds like it would be a great place for a date night! I’d like to try the lump crab cakes for a change. I enjoy Outback. They have great food and super service. We always go to Outback for special dinners! I would love to try the Aussie Chicken Tacos for lunch. Outback is simply the best and you can’t beat $6.99 dollar lunch specials! I could really go for some Outback tonight. Too bad it’s snowing again like crazy! Looks so good! I love that they show all the different cuts of steak, yummy! My husband and I have been married nearly 20 years now, and the only time we have been to Outback Steakhouse was once with his grandmother. It would be nice to have a date with him there now. The Valentine’s Meal for Two looks really awesome for the weekend! I love their steaks, and the Aussie Chicken Tacos! Thanks so much for the chance and for all of your hard work! Wow new hand carved roasted Sirloin steak. I can taste it already. I love Outback especially that brown bread. I didn’t know they had fancy cocktails! They mango passion fruit ‘rita sounds great! That sirloin looks delish. Love Outback and its blooming onion…. The MARSALA ROASTED SIRLOIN is so delicious! It is now my favorite at the Outback Steakhouse! I Love Outback and the Roasted Sirloin looked so delicious, I usually get the prime rib, definitely will have to try the roasted sirloin next visit. I would like to try their SIRLOIN* WITH GRILLED SHRIMP ON THE BARBIE. The hand carved roasted sirloin sounds like a winner to me! It’s funny though, I love Outback and I love steak, but most of their ads gross me out because they show steaks that are so RARE…I’m a well done steak kind of girl! We love their steaks and Bloomin Onions!! OMG those look so amazing!!! Makes my mouth water just looking at the pics! But of course, The Outback always has the best steaks around!! Steaks look awesome, can’t wait to go there…. I want to win a gift card to try the new Classic roasted Sirloin! One of my favorite restuarants! We love Outback Steakhouse…I know it isn’t steak but I have to say…they have some of the best tuna steaks though! Oh boy am I hungry now! LOL, I got stuck looking around on that menu! MMMMmmmm……I know that I would love to eat there and treat my son to Outback Steakhouse in Corpus Christi, TX! I’d love to try the roasted sirloin. It sounds delicious. I haven’t been to Outback in a very long time but those Aussie Steak tacos look mouth watering and I would sooo devour them! Gotta add a nice cocktail and the Sauza Gold Coast Rita sounds like it would most def hit the spot after those delicious tacos. Ok now I’m hungry! LOL! Thanks for the chance! I love outback & it’s been a very long time since I’ve been there, this sure would help me getting back there sooner. Thanks for the opportunity! Classic Roasted Sirloin sounds heavenly with those side items! It is a beautiful and savory combination that I would love try. I could really REALLY go for a steak! I’m definitely most excited to try their new classic roasted chicken! Slthough the roasted sirloin DOES look pretty scrumptious! I love the ribs and seem to always order them no matter how many times I look at the menu. The Roasted Sirloin looks very good! I love Outback Steakhouse. The Valentine’s dinner for 2 is a great deal. My favorite dish is Alice Springs Chicken. The Valentine’s Day Menu looked good – wish I had seen it earlier! That sirloin looks really good! The new Sirloin Steak dishes are what my husband would enjoy. They’re too rare for me! But I love other items at Outback! Those look great. I would love to try the Salted Caramel Cookie Skillet. That looks delicious! I love Outback. My favorite is the Steakhouse Salad and the Chocolate Thunder from Down Under, thanks! I love the Rib eye steak. We love Outback! My favorite is their Alice Springs chicken…and of course the bloomin onion! I visited the page and the Bloomin’ Onion is my favorite. It would be the Ribeye for me. Outback is a treat for my family. The closest one is an hour and a half away so we enjoy when we visit. Always great food and great service. I would like to try one of the combination plates. that way I could try more! We love to go out to eat at the Outback. I like the ribs and sides. 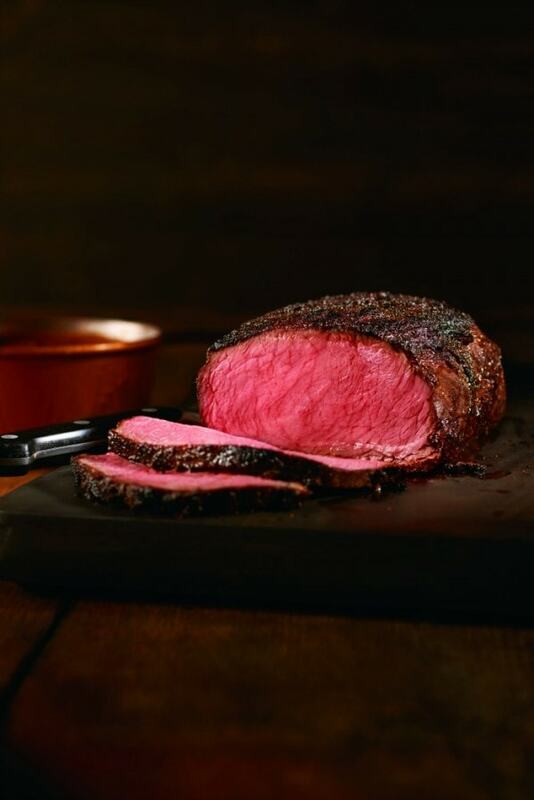 The new Hand Carved Roasted Sirloin looks delicious. Topped with Bloomin’ Onion® petals, American cheese, lettuce, tomato and our spicy signature bloom sauce. Believe it or not, I’ve never been to Outback. I would love to try the Bloomin onion. I love Outback Steakhouse! The double burger looks delicious! The perfectly grilled salmon looks great. YUM LOOKS SO GOOD. hOPE TO WIN. The AUSSIE CHICKEN TACOS sound excellent! The endless French Onion Soup and Salad would be killer, I could probably have them bring out the whole kettle! My husband would love the hand carved roasted sirloin. My favorites are the bloomin’ onion, with any steak and lobster or shrimp. Thanks so much for the chance to win Jen! That looks delicious. I’ve never been to Outback before. Would love to try it!! I visited the Outback website, now I need to visit the real Outback! ALICE SPRINGS CHICKEN sounds really good! Sounds like a nice date night! The MARSALA ROASTED SIRLOINROASTED SIRLOIN looks delicious. I love Outback! The Alice Springs Chickens is super yummy! I love that they have normal foods on the kids menu. My 6 year old loves they joey steak and broccoli. I want to try the Firecracker Salmon. I really want to try their bloomin onion here! I have heard so many good things about it! The Teriyaki Steak Medallions sound delicious! Their sirloin looks great – I like that they explain the different cuts on the website. I haven’t been to an Outback for quite some time now. They added some delicious looking new menu items since last I’ve been. I would love to try all the new roasted sirloin varieties. The Marsala Roasted Sirloin looks really good. I would love to win. My husband and I never get to treat ourselves and I love Outback. Thanks for the giveaway! I haven’t been to Outback in a long time. I think it’s time to pay a visit and try one of those roasted sirloins.